Whether you are a construction company, architecture or engineering firm, you are all involved in developing projects, which require cost estimation, scheduling and project control. STR Vision CPM is a powerful and flexible software designed and developed by AEC Industry Specialist to enhance your control capacity and to monitor the probability / impact of unfortunate events in order to minimize risks. Nowadays, more than ever our job depends on shared information during all phases of the project. Design, Estimation, Scheduling, Execution and Maintenance require reliable data to provide qualitative and effective management of your building project. STR Vision CPM allows you to oversee the planning & execution phase as well as share information with people involved in the project. STR Vision CPM is ready to support you in scheduling and planning your activities.The time schedule can be created starting from the calculation's groupers, the price list items or by creating a new one from scratch. You may develop your schedule plan managing the complexity, starting from several levels down to single lines of quotation, or define a more concise one (for example through the work and article type EPU). Planning can be done by either using the constraints between tasks (Start-End, etc. 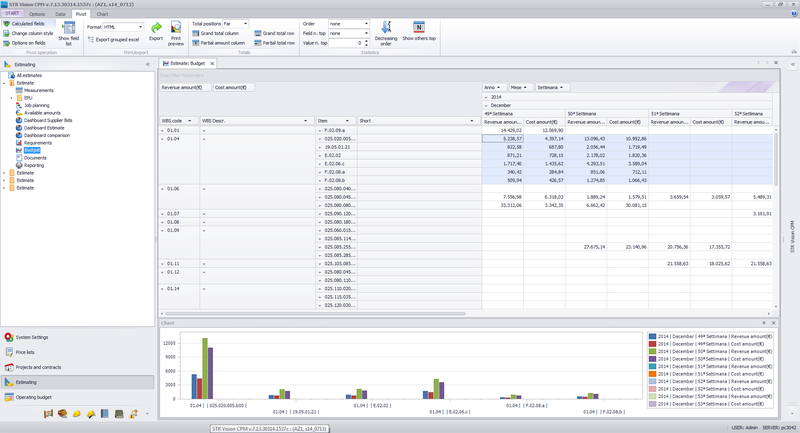 ), assigning yourself start/end dates, or dragging the Gantt bars directly on the graphic interface. The system displays the critical path and the temporal progression of the project economic data. The duration of activities may also be obtained from the execution time calculated using the analysis module of STR Vision CPM. Finally the time schedule obtained can be converted as a Microsoft Project format to guarantee a high level of interoperability. Once won the contract, it becomes essential to realize the so-called "operational control" also from a management point of view, to define the timing of works, budget, the financial performance, the preparation of the list of requirements for the procurement. STR Vision CPM fully supports these functions through the cost analysis modules, job scheduling and management of needs. All work can be analyzed in terms of costs with the ability to get the prices straight from integrated ERP; (lists or suppliers movements based on costs per hour of labor and equipment). The operational estimate is the basis of all the control functions of the job order.